Those who know Hop Nation know that founders Sam and Duncan are both winemakers who met working in vineyards and travelled the world before deciding to start making beer in Melbourne. It turns out they're not the only people within their group of mates to follow that path; Duncan's mate Logan Richmond ended up working for the Sawmill brewery in New Zealand, and it was Sawmill's old brewery that Hop Nation bought when setting up their home in Footscray. Earlier this year, they reunited at Sawmill to create an all Aussie pale ale together. Now, the second half of the collaborative project is here. 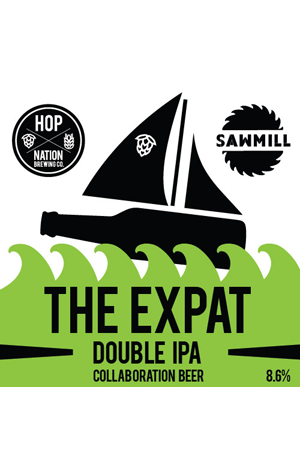 That beer is, appropriately, The Expat, a double IPA that acts as a showcase for Kiwi hops, namely Nelson Sauvin, Motueka and Moutere (formerly Brooklyn). Given how popular their normal IPA, The Chop, has proven, we imagine there will be plenty keen to try this one. As for the tasting notes, the brewers are keeping things simple: "Big, bold and damn hoppy."